Displayr is a data science and visualization application that is easy-to-use for novices but powerful for data specialists. It provides a single platform for exploration, modeling, visualization, and reporting. With this, you save time from switching between different and incompatible solutions. Though it has a user-friendly interface, Displayr is dedicated to providing you with robust tools and features for the best results. It utilizes advanced methods and it offers full support of the R language as well. As such, you can employ the solution comprehensively for all your data needs. Furthermore, Displayr gives you a space for collaboration with your teammates or external partners. It automatically synchronizes every change a person makes on a data to ensure that everyone is working on up-to-date information. Your colleagues, superiors, and partners can reproduce whatever result you gain from your first data visualization. That is because Displayr helps you ensure that your information is of the best quality to give you utmost confidence. In the case new information is added to your data, Displayr automatically updates existing reports it might affect. With this, you can present the new set of intelligences to your teammates and the company executives without wasting precious seconds. 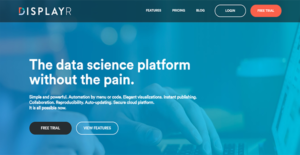 Though Displayr is dedicated to making the novices feel at home in the platform, it also provides professional data scientists the advanced tools they require. One of these is the R language, which the application fully supports. With this, data veterans in your team can conduct complex calculations in the same program. When you need to adjust the placement of variables, you can do so with ease as Displayr has an intuitive drag-and-drop function. By abstracting complexities such as codes, recent hires and data novices can be productive in a short span of time. Displayr is capable of running a wide array of statistical tests. Thus, you can expect accurate results regardless of the type of data you have. This lets you minimize your expenses as you can employ a single platform for both testing and analysis. Displayr gives you a broad array of options when it comes to visualizing your data. This way, you can present your information in a more engaging manner than simple paragraphs and figures. Graphical data is also easier to digest for your audiences so you can rest assured that everyone is on the same page as you go through with your presentation. For better dissemination, Displayr enables you to publish your data on the web and as Excel or PowerPoint files. This lets you spread information across the organization in a more streamlined manner. Thus, every member can consult the data to assist them in their decision-making. If you are considering Displayr it could also be a good idea to investigate other subcategories of Best Data Analytics Software collected in our database of B2B software reviews. Since each enterprise has specific business requirements, it is advisable for them to abstain from looking for a one-size-fits-all faultless software application. Needless to say, it would be pointless to try to find such an app even among market-leading software solutions. The smart thing to do would be to jot down the various important factors that require consideration such as main features, budget, skill levels of workers, company size etc. Then, you should do your homework thoroughly. Read some Displayr reviews and investigate each of the other systems in your shortlist in detail. Such exhaustive research can make certain you reject ill-fitting systems and choose the solution that provides all the aspects you need for business success. How Much Does Displayr Cost? Displayr has two straightforward enterprise pricing options for commercial organizations and educational institutions. The fees are to be paid in an annual basis and the packages assume that creators use the application for 40 hours per week. Additionally, the licenses allow unlimited viewers. We realize that when you make a decision to buy Data Analytics Software it’s important not only to see how experts evaluate it in their reviews, but also to find out if the real people and companies that buy it are actually satisfied with the product. That’s why we’ve created our behavior-based Customer Satisfaction Algorithm™ that gathers customer reviews, comments and Displayr reviews across a wide range of social media sites. The data is then presented in an easy to digest form showing how many people had positive and negative experience with Displayr. With that information at hand you should be equipped to make an informed buying decision that you won’t regret. What are Displayr pricing details? What integrations are available for Displayr? If you need more information about Displayr or you simply have a question let us know what you need and we’ll forward your request directly to the vendor.